If this Bulls/Detroit Pistons series of recent years becomes a TV show, perhaps they can call it “Eighteen is Enough” as the Pistons Sunday finally ended the Bulls 18-game winning streak with a mostly unremarkable 99-85 victory. And if this Bulls regular season should get TV treatment, perhaps it becomes “Thirteen is Enough,” which is the number of different starting lineups the Bulls have used this season with Luol Deng going out Sunday mostly to rest a mild hip injury and Joakim Noah and Marco Belinelli returning in limited minutes from their latest eight-game absences with injuries. Though that still left Taj Gibson and Richard Hamilton out, probably the rest of this week as well, and, of course, Derrick Rose, who told reporters at the team’s shootaround earlier in the day he still could return, maybe even once the playoffs begin. Though that also raises the question about working players in as with Noah and Belinelli on limited minutes Sunday, the Bulls looked a mess with uncertainty about who was covering whom, who should be in the game when and what to do when you were. Noah indicated his plantar fasciitis will remain an issue the rest of the season and Belinelli took a hard hit, though he said he shook it off. And with a recurrence of his previous knee injury injury and Gibson saying he won’t be fully recovered this season, either, another question may be hanging over the Bulls: Whether these returns on limited minutes help or hurt. “Because there’s change you can’t use that as an excuse,” said Bulls coach Tom Thibodeau. “Whoever is out there we’ve got to get the job done. We responded the other way when guys went out (winning six of eight after Noah and Belinelli and then Gibson went out). Now when guys are coming back we’ve go to respond the proper way. Which suggests Thibodeau also understands how much the issue was on display Sunday against a Pistons team that hadn’t won at home since before the All-Star break. The Pistons went to 26-52 while the Bulls are now 42-34. The Bulls played well basically in just one stretch, the first seven minutes of the game when Noah started but had to leave given he was limited to about 20 minutes. Noah finished with 13 points and seven rebounds in just over 21 minutes and was the only Bull in the game with a plus rating in the game plus/minus stat for how your team does when you are on the floor. Noah blocked a Greg Monroe shot to open the game, got to the free throw line with some aggressive moves and made four of four (the Bulls were only 16 of 25 overall on free throws) and created the space for Carlos Boozer, who ended with 21 points and 10 rebounds and had a dunk and jumper playing off Noah. When Noah left the game for the rest of the first half with 4:42 left in the first quarter, the Bulls had an 18-7 lead. The Pistons went to a quicker front line with Monroe and Jonas Jerebko, whom Nazr Mohammed wasn’t able to chase effectively and went on to have 17 points, his fifth highest scoring game of the season, and a season high nine rebounds. The Bulls would have gone to Gibson to counter such a lineup, but only had Vladimir Radmanovic, who also is slow. Brandon Knight, often playing against starting shooting guard Nate Robinson with Jimmy Butler moving to small forward with Deng out, led the Pistons with 20 points as he was able to get to the basket. Robinson had 18 points while Kirk Hinrich played almost 38 minutes with seven points and eight assists despite playing with the flu. So even as the Bulls got players back, they clearly struggled as well, especially given Noah and Belinelli, the latter scoreless in 20 minutes with two shots, were on time limits. It makes it even more difficult to have a rotation. And though you certainly would want Rose back, if possible, he’ll be on a time limitation as well. “Some good and some bad,” Thibodeau offered about the returning players. “You can’t miss that amount of time (and be in rhythm and ready). Unfortunately, the games keep coming and they come quick and we’ve got to be ready. I thought defensively we were very poor (Detroit shot 53.4 percent and outrebounded the Bulls 40-33). Just until the players came back with playing limitations. Thibodeau never said that, but the thought hung out there like in a speech bubble. Though I also think Thibodeau may have been musing about the red baron. The Bulls still remained fifth in the Eastern Conference. But it seems less likely given the circumstances they’ll be able to pass the Nets for home court advantage in their likely first round playoff series. The Nets have a two-game lead over the Bulls and a similar closing schedule regarding winning and losing teams. The Hawks are just a game behind the Bulls, but have two more losses as they only have four games left and the Bulls hold the tiebreaker. So the Bulls’ issue, as much as any of the closing teams, is not only getting healthy but getting a playing rotation. And that looks difficult at this point. “You want to play,” said Noah after the game. “I can’t right now. You have to do what’s right and get ready for the playoffs. I haven’t played in a while. So I think the more I play, the more I’ll get into a rhythm and the better I’ll feel. It felt OK. It’s something that’s going to linger on so I’ll just have to keep getting all the treatments. So it is a broken down bunch staggering down the stretch. And even having played better when the players were out and not in and out of the lineup. But if you can get regular contributions from those injured and even get Rose, you assume the Bulls would have to be improved. Assume, anyway. Of course, anytime Deng is out it creates a void, and even though no one criticized Deng, Thibodeau, nevertheless, went into another lengthy defense of Deng and his importance to the team. As an aside, Deng must be the most consistent player in the NBA. He averaged 16.7 in 23 games since the All-Star break and 16.7 in 47 prior. His monthly averages have been between 14.8 and 18.4. In six of the seven days of the week, he averages between 16.1 and 17.8 and the only variance, if it can be called that, is 13.2 per game on Thursdays. Deng averages 17.1 at home and 16.3 on the road and shoots 42.3 percent at home and 42.5 percent on the road. He shot 42.3 post All-Star and 42.5 percent pre All-Star. I’m not sure what it all means, though the Bulls miss him badly when he doesn’t play 40 minutes. So the Bulls labored on and got walloped off the bench 43-12 with just four of 16 reserves’ shooting, though Malcolm Thomas got four points in a last minute of the game. Still, it may not be the answer. The Pistons pulled within 26-23 after one quarter as Noah left. 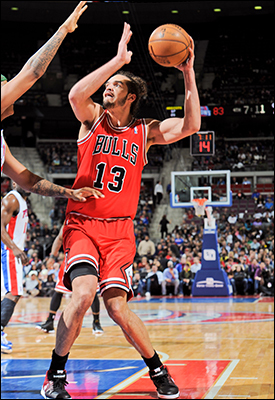 And remember in the two games Noah played against Detroit this season, he averaged 20 points and 20.5 rebounds. But the Bulls did have to rally from big double digit deficits in all three previous wins that ran their winning streak over the Pistons to 18. The Pistons took the lead for good early in the second quarter with Jerebko and Charlie Villanueva going outside against Boozer and Mohammed. When Thibodeau countered with Daequan Cook and the rusty Belinelli, the Bulls couldn’t make shots and Robinson isn’t a defensive stopper at 5-7. The Pistons led 50-46 at halftime and then relentlessly pulled away, leading 75-67 after three despite the Bulls shooting almost 56 percent in the third quarter. 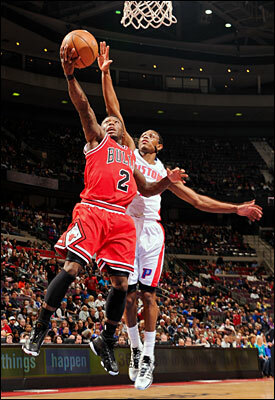 But Knight had a dozen in the third as a weakened Hinrich even with three steals couldn’t match his quickness. Worse, the Pistons made the Bulls look bad in transition with the changing lineups as they had 16 fast break points and had a 15-11 edge in second chance points, usually a Bulls certainty. But as Thibodeau always notes, defenses are tied together and with so many players coming and going and in different positions, it’s hardly surprising so many defensive assignments were being missed. It wasn’t so much fatigue, which usually is the unthinking excuse for poor reaction, as much as rampant unfamiliarity. Mohammed once sealed Hinrich on a fast break defense moving to cover his man. Interestingly watching this game, I thought of 2009 free agency. That’s when Boozer had an opt out and went on radio in Chicago and Miami talking about playing there. That didn’t help the reaction on his returns to Utah. The inside talk then was Boozer would sign with the Pistons, who had the biggest free agency money available before the big 2010 class. But the Pistons passed and Boozer ended up having to opt in and play one more season in Utah. 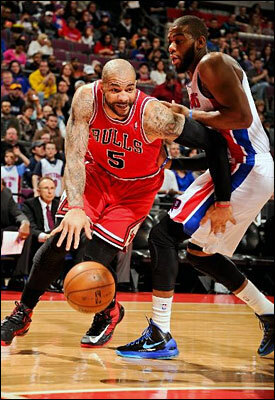 The Pistons went for Ben Gordon and Villanueva with the money they were to pay Boozer. Which didn’t work out for them as much as it did for Boozer. Who lost to the Detroit Sunday for the first time as a Bull. The Pistons began pulling away in the fourth, taking an 87-74 lead before Noah hit Boozer for a slam dunk and then with 4:33 Butler stole a Will Bynum pass. Six seconds later, Robinson pulled up in transition for a 28-foot three pointer that missed badly and cost Thibodeau at least seven more hairs. Robinson then, as he’s wont to do after a mistake, fouled Jerebko, who made both for an 89-76 Detroit lead with just over four minutes left and it was pretty much over. Everything but who can play and for how long. And there’s not much time left before the playoffs to find out.